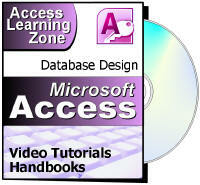 This Microsoft Access video tutorial picks up where Level 7 left off. This class covers creating different types of combo boxes (also called drop-down boxes) and list boxes, to give the user a list of options to choose from on your forms. We will also learn how to control the tab order of our forms. This class picks up where Level 7 left off. We will start by learning how to create a combo box from a list of values that we type directly into the box (a value-list combo box). 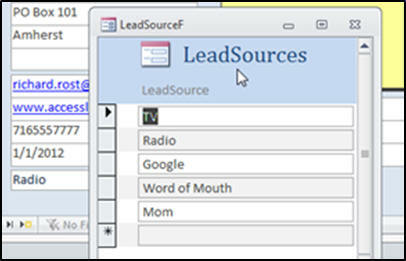 We will track lead sources for our customers (where they found out about us) such as TV, radio, Google, etc. You will learn how to force the user to pick a value on your list, or allow them to enter their own. 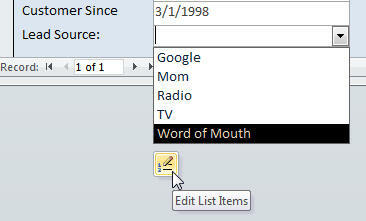 You will also see how easy it is now in Access 2010 to edit that list of options on the fly. Next we'll create a table-based combo box. This is where the combo box gets its list of values from a table that you create. You'll learn why this is a much better method for making combo boxes. You'll also learn how to create your own custom form for editing or adding to the list of options in the combo box. Next you'll learn how to create a multi-column combo box, where you can see 2 or more bits of data in the combo box when it's open. 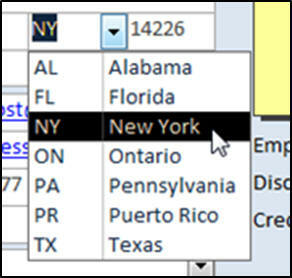 We'll make a table with a list of states and you'll be able to see the abbreviation for the state, and then the full state name when the box is opened. You'll learn how to control the list width, column widths, number of list rows, and more. You will learn how to create a combo box to search for a record in your form based on a field value. We'll make a search box where we can quickly jump to a customer based on their company name. 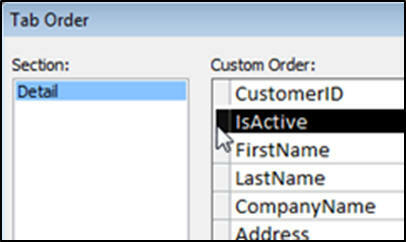 You will learn how to create list boxes. A list box is a close cousin to a combo box. You'll learn about the differences between combo boxes and list boxes, and how list boxes offer different features than combo boxes do. You'll learn how to quickly convert between list boxes and combo boxes (turn one into the other, and vice versa). You will learn how to control the tab order on your forms. This is the order in which Access moves between the different fields on your form when you press the TAB key. You'll learn how to skip particular fields with the Tab Stop property, and how to control where the tab order goes when you pass the last field with the Cycle property (stay on the same record or move to the next record). Why is it called a Combo Box?